May 3, 2017 – Brain4Net, an innovative SDN/NFV based solution vendor, today announced the B4N Visibility Fabric solution. The solution allows customers to take advantage of scalable TAP-aggregation fabrics utilizing 10/25/100G OpenFlow-based switches. B4N Visibility Fabric is aimed at the creation of distributed intellectual network, which is able to aggregate, filter and replicate multi-source traffic and transfer it to centralized monitoring, management and security systems. Staged migration of Data Center Network Infrastructure and transition to CLOS-topology, 25/50/100G Ethernet technologies and broad SDN appliance lead to imminent monitoring and security systems upgrade to modern network architectures level. Data Centre capacities, frequency passbands ranges and traffic amounts lead to monitoring and network security capacity increase. This classic approach, based on Network Packet Brokers (NPB) – proprietary network devices with limited compute capacity, becomes cost-intensive and difficult in implementation for complex network monitoring. Incremental growth of separate appliances implementation and multiple proprietary technologies lead to a high cost of ownership for the hyper-focused network devices for traffic aggregation. Difficulties with scalability and extremely high operational expenses force organizations to find new cost-effective solutions, designed in accordance with new DC network infrastructure standards.The unique Brain4Net traffic aggregation approach guarantees to corporate customers and service providers a significant improvement of DC network infrastructure scalability and granularity metrics, while decreasing both OPEX and CAPEX. B4N Visibility Fabric, brand-new solution by Brain4Net, ensures smart TAP-aggregation by utilizing the advantages of B4N Service Platform and cost-effective highload 10/25/100G switches with open architecture. The solution allows building scalable network fabrics for traffic distribution from traffic mirroring devices to security systems like Intrusion Prevention Systems (IPS), Data Loss Prevention (DLP) and Network Firewalls. The B4N Visibility Fabric architecture considers scalability, from 1-2 switches to multi-level cascade fabrics. Traffic replication to multiple ports, which allow different monitoring systems to access one copy of traffic. 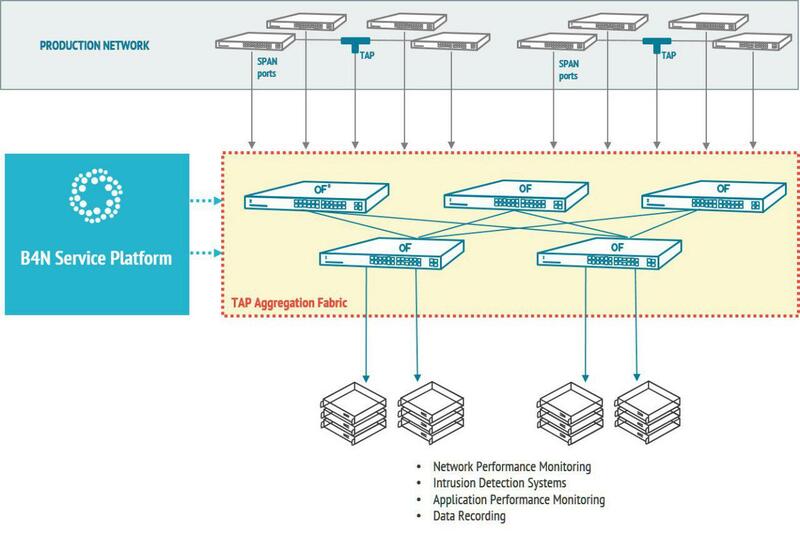 On technology level, B4N Controller, B4N Service Platform component, ensures centralized network fabric management by allocating filtration rules and mirrored traffic transferring from TAP-modules, while ensuring traffic distribution between analytical modules. The B4N Controller also provides the system GUI and REST API for integration with third party provisioning systems. Support for various topologies of mirroring – Any-to-Any, Many-to-One (TAPs and SPAN-ports), One-to-Many (dividing the incoming traffic stream into several and sending different types of traffic to the corresponding ports). B4N Visibility Fabric to the moment ensures compatibility with Ezchip NP-5- based x86-based switches. Brain4Net actively develops compatible hardware list and plans to present its extended version with Broadcom StrataXGS and Mellanox at the next major platform release.